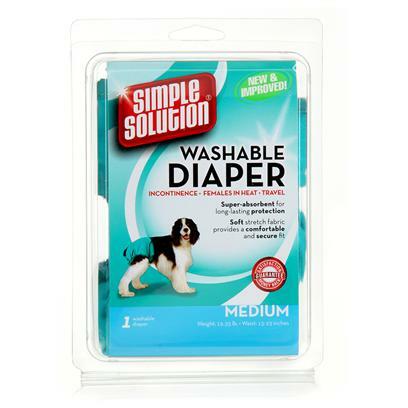 Simple Solution Washable Diapers are the perfect answer for pets experiencing excitable urination, pets with incontinence, female pets in season and puppies that are not quite housebroken. Each garment is lined with a soft plaid flannel fabric for comfort as well as an absorbent mesh liner for protection from leakage. For light seasonal flow or minor excitable urination, the garments may be used alone. For heavy seasonal flow or more serious cases or urination, simply attach a Simple Solution Diaper Garment Pad to the diaper's built-in mesh liner. See instructions on packaging for proper fit and care.